March is the month of expectation. To take a backward look. A blue and gold mistake. Here’s a fascinating post about the poet Emily Dickinson. Apparently she wrote all her poems sitting at that little square table! 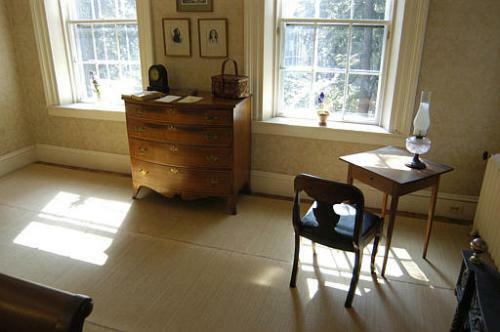 Whilst I was speaking at a CS Lewis conference in Amherst I had the opportunity to visit Emily Dickinson’s house, now beautifully preserved as the Emily Dickinson Museum. And so I came to stand in that ‘mighty room’ where all the poems were written, and there, plain and simple and strangely, paradoxically, small was her little desk: a small square writing table. I was filled with wonder at how much had flowed from so small a space, but then I thought about Dickinson’s characteristically concentrated and terse verse forms; those compact and concentrated little quatrains with the emphatic dashes linking and yet binding in the energy of her phrases, and it seemed to me the smallness of the desk was itself part of the form of the poetry, part of her gift.